Climate and geology have conspired to make the Pacific Northwest home to some of the most beautiful landscapes on earth. It's an outdoor lover's paradise, and one of the best ways to experience this beauty is hiking. Now, deciding which hike is right for you is easier than ever. Author Lisa D. Holmes has provided a visual guide to choosing a hike with features that best fit the season. This full-color book features 400+ photos and customized maps that literally bring 25 Portland area hikes to life. As a graphic designer and avid hiker, Lisa has combined her passions to capture each hike in a way that clearly shows you what to expect. 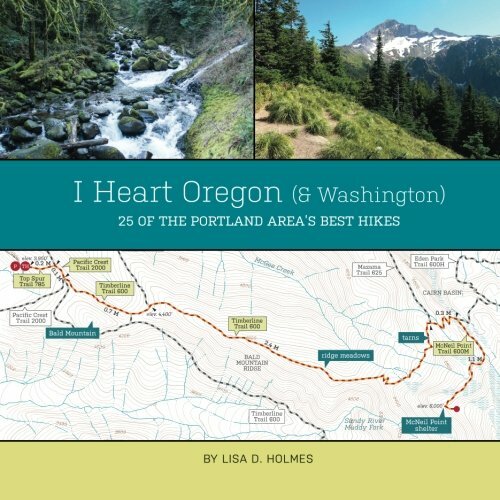 Covering hikes from the Oregon Coast to Mount Hood, and from Southwest Washington to the Willamette-Santiam region, this book is a must for visitors to the region, as well as local hikers who want a better idea of what to look forward to. Lisa D. Holmes is a graphic designer by trade and a hiking fanatic by accident. Using the Bachelor of Fine Arts degree she earned at the Kansas City Art Institute, she has spent more than 20 years designing a successful career. But Lisa's life changed when she moved to Oregon in 2007 and became obsessed with the beauty of the Pacific Northwest landscape. She has since spent much of her time hiking the trails of Oregon and Washington and taking photographs of everything she encountered... over 8,000 so far. Combining her photos, her map and book design skills, and her desire to share her journey with others has led her to her new career of creating books about the landscape she loves. Lisa lives and works in SE Portland with her husband, John Clark Vincent. Visit iheartpacificnorthwest.com for more info about the book and to view her hiking blog.